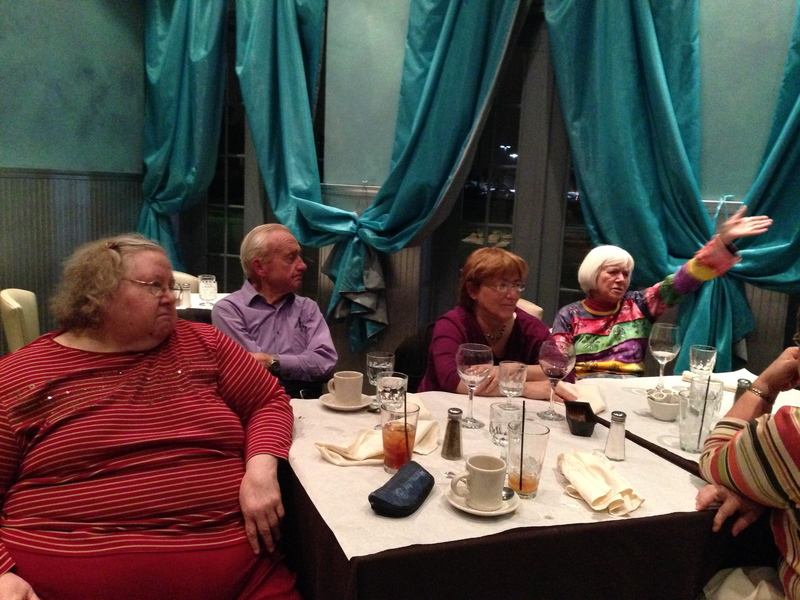 Seven members of the Chicago Partners met Wednesday, October 23 for their regular monthly gathering at Cucina Biagio’s to pray, dine and share. Irene reported on her recent two-week trip to Poland (see above picture) where she got a chance to visit the gravesite of her great grandparents and to buy a statue of Saint Pope John Paul II, no, not Blessed but Saint. She explained that when she pointed out to the proprietor of a gift shop that they would have to soon replace the statues of Blessed Pope John Paul II, the proprietor said no problem. He went to the stock room and returned with the St. Pope… statue. Father Sebastian also just returned from vacation where he encountered, or at least heard stories of encounters with the wild animals like mountain lions, bobcats bucks and deer coming down the mountain near the Passionist Retreat House at Sierra Madre, California. We all celebrated his safe return home. On the business side Dan demonstrated how to become a follower on our Blog and encouraged all to not only read the blog but also to let your friends on Facebook know of our blog by clicking the Facebook Icon and sharing. He also encouraged members to write posts as well as to comment on posts they like. Dan encouraged everyone to use Meetup to RSVP for the coming meeting. That allows Penny to call the restaurant and let them know how many people are coming as well as lets people who may have noticed the Partners’ Meeting on Meetups weekly announcements and are thinking they might like to come. They would more likely come if they knew there were more than a few people coming already. Finally in an attempt to attract new younger people to our meeting, Penny suggested and all agreed that anyone who brings someone half their age to a meeting, the Partners would pay for their dinner. We ended the meeting by all participating in the British Jesuits Media Initiatives’ Pray-as-you-go prayer for the day.